Let me put this down first: 2019 is going to be a year of global wealth re-distribution, and money will sneak out of your retirement nest egg if you still try to make and preserve your wealth in a conventional way. The fact that you are reading this article is probably because you care about your family’s financial matters. 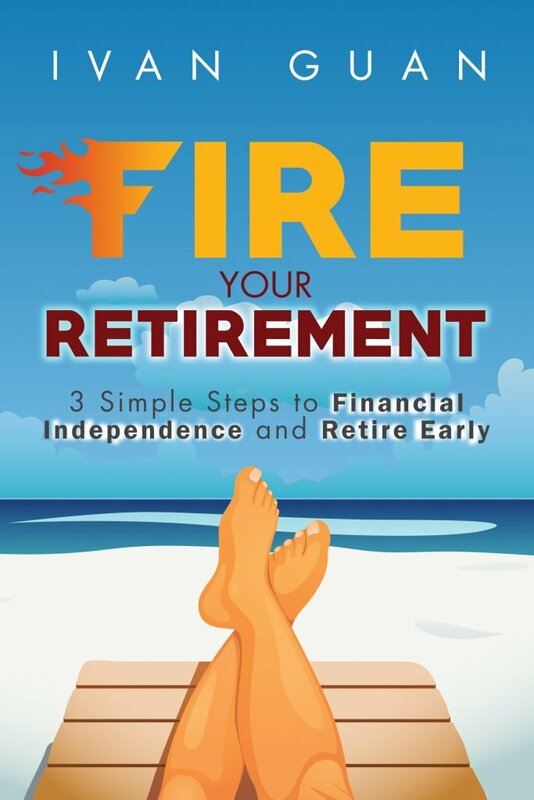 You want to make good financial decisions, you want to grow your wealth and retire comfortably. But if you look at the financial world that you live in today, there are a daily influx of market-moving headlines, investment predictions, wealth building “secrets”. After all, newspapers and advertisers need sensational reports to drive traffic. Many investment commentaries, despite industry-related pedigree and impressive educational backgrounds, were just repeating what has already happened. It is often said that when we are in the thick of things, we can’t see the forest for the trees. Our visions are often impaired by the obstacles that surround us. It is hard to distinguish between information and noises. Therefore, you need a birds eye’s view. Instead of attempting to predict the economy and stock market direction, or deciphering a mountain of past data and work on incalculable variables, wouldn’t be easier to just look at now? So let me show you what is in my mind about the financial markets in 2019 and how these changes affect you. Some of these “predictions” may sound outrageous but I hope they can give you some new perspectives. If I am wrong, it is ok. We all make mistakes. The most important thing is that we document our thinking process, knowing why we were wrong and learn from them. For the benefits of most readers, I will skip some technical details and jump to the conclusions. If you are interested in understanding more of a particular topic, leave your comments below and I will explain more in the future posts. If you think the property price will always go up in the long run, you may be right. But it can be a very, very long time, so long that it may be beyond your retirement age and your interest in investing in property any more. Ask the older generation, they will tell you how they suffered from the Asian Financial Crisis. At that time, Singapore property markets were sky high and eventually crashed. How long did it take to recover? Look at the chart below, it’s 14 years! What is useful to us is not how dramatic this episode was, but the cause of the debacle: the Liquidity Crunch. In another word, there is not enough money (or interest) buying properties. How do we tell? It is already reflected in the bond yield curve. You may read from the new about “inverted yield”, “flatting yield curve”. If you don’t understand, it is fine. 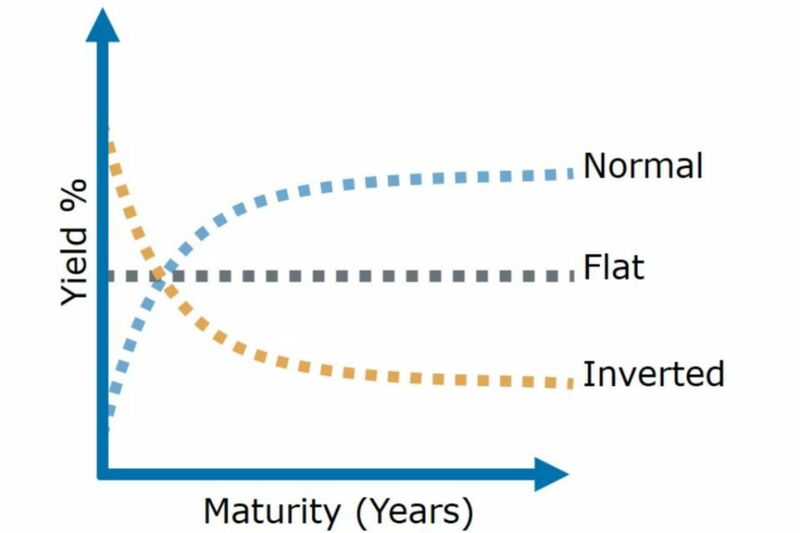 Yield curve is talking about the relationship of “interest rate to borrow money” and “duration of borrowing money”. Let me jump into the conclusion. When the long-term interest rate is equal or lower to the short term interest rate. It reflects the unwillingness for people to borrow for the long term. Now think about when do we need to borrow money for the long term? For business, it is for research and expansion; but for individuals, It is our mortgage! Ask yourself, do you prefer short-term investment or long-term investment now. It is no surprise that 3-year endowment plans like China Taiping’s i-Save (2.38% Yield) and NTUC’s Capital Plus (2.15% yield) was snapped up as soon as it was launched. The unwillingness of borrowing for long term pushes up short term interest (the bank charges you more interest if the demand is high) and pull down the long-term interest (the bank has to lower interest to attract people borrowing for the long term), thus a “flattening yield curve”. This is not just happening in the US, but a global phenomenon including China and Singapore. How do you tell? Look at Singapore Savings Bonds (SSB)’s offer. Did you notice that in the past 4 years, while the 1-year average interest of SSB was increasing, the long-term return actually dropped? For people who like Fixed Deposit investments, you may have noticed that banks are having more “attractive” offers nowadays. Don’t be too happy with the slight increase in your interest in your bank account. Money was evaporating from your biggest asset, your property investment. Given the sluggish stock market and historical low yield, some you may be tempted to buy property “at a bargain”. This is understood. If there is one emotion that is more financially damaging than “fear to lose money”, it is “fear to miss out”. Who can get over the fact that your neighbour, your friend made million dollars through “property investment” in the past? For most property owners or developers, 2019 will be a hard year to sell your property, especially in Singapore. But there are always ways to make money even in a downtrend property market. The savvy investors always take advantage of liquidity crunch to get better deals. US market had a roller coaster ride in 2018. And now you heard a lot of “experts” asking you to buy because it is cheap. I talked about our Anchoring Bias when readers asked if they should buy Facebook stock when the price dropped sharply in July 2018. Cheap or expensive is always relative. Look at the chart below, while $180 may seem cheap at that time for Facebook, $145 is what the market is willing to pay today. Now I want to show you a “scary” chart, it maps the stock market history comparing to the US stock market (representing by Dow Jones Index) during 1929 Great Recession. The black colour line shows what happened to the US Stock market during the 1929 Great Recession while the Candle Stick Bar (colourful one) shows the current stock market. If you think the December 2018 crash of the US stock market was dramatic, you haven’t seen the big BANG. Are you investing for your retirement? If you choose a strategy like “Buy and Hold” or “Value Investing”, you essentially leave your fate to Mr Market. And the market doesn’t care when you retire. Am I saying that US stock markets will have a great recession in 2019? I don’t know and I don’t care, because buying low or dollar cost averaging will only add to your portfolio risks and not reducing it. When you take on risks in a volatile market, you may have a home run, but sooner or later you will give it all back. In my earlier article about US-China trade war, I told you to be careful interpreting the news you read. As an English reader, it is natural that you are influenced by US-based reports. And you should always take it as a half-truth. Several years ago, I stumbled upon this image. 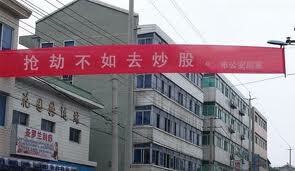 It is a propaganda banner put up by the police in one of the cities in China. It said, “It is better to play stocks than to rob!”. Can you rationale such a banner displayed in the City Hall? The behaviour of China stock markets is different from what you can learn from western financial textbook and newspaper commentaries. Ironically, despite all the bearish comments about China, fund flow shows the Wall Streets are putting their real money into the China markets. Some Singaporeans were “burned” by China-related stocks (S-chips) in the past, they blamed their loss due to China stocks’ lack of corporate governance, shabby business, etc. The chart below is the 13-year long-term chart from 2005 until now. China market had its booms and dooms. For every dollar you lost, there was a dollar made by other people. If we lost money in the stock market, it is because our skill is no good, not because “nobody can beat the market”. When someone tells you that there are no investment opportunities in 2019, it is probably because the person has not looked out. The euphoria of an asset class is so easy to be spotted by the number of articles published in the newspaper. But it is hard to find hidden gems because it is always an abandoned child. Between 2010 to 2011, I repeatedly reminded readers to watch out the madness of gold guarantee investment. And the Gold price crashed right after I pointed out the top in August 2011. The gold price was down for more than 7 years. How often do you hear the newspaper talk about Gold investing in recent years? Very seldom. Why? Because the US stock market was good. If 2019 is the end of a decade long bull run of US stock market, with the backdrop of global uncertainty, we can see it looks like that Gold is brewing a breakout. Despite the glamour before 2011, talking about a Gold investment is still a “hard sell” today. When I told my client about gold lately, I got a yawn most of the time. That is just human nature, we tend to focus on the “new” things in the market like Bitcoin or FAANG, and we only get hands itchy when an investment opportunity is all over the news. You don’t have to invest in gold today, not the Gold ETF (GLD) or physical gold. Treat gold price as a thermometer. It gives you an idea if a stock market rebound is short term or a starting of a solid trend. Of course, if you have “Si Dian Jin” (4-piece set of wedding jewellery as a traditional custom) is in your shopping list, you probably want to do it fast. Gold has reached a level while the downside is limited. I didn’t want to talk about Singapore markets because it is still directionless. But recently I find the voice of regular-savings-plans into STI ETF is high, so I decide to share my opinions. Is it better to regularly invested into stocks ETFs in a volatile market or buy more because the valuations are “cheaper”? Earlier on, I have shared with you the anchoring bias, cheap is relative. Just a few days ago, Business Times published an article with a catchy title “STI generates 9.2% annualised total return in the 2009-2018 period: SGX”. It sounds like a good deal to stay on course. I want to tell you it is not that ETF investing or Dollar Cost Averaging doesn’t work. It is that you, the person who decides to invest in such a matter will not keep to your long-term plan. How much return do you think you get by faithfully investing in Singapore blue-chip stocks or STI ETF in the past 5 years? Is your STI ETF holding still in red now? If STI doesn’t turn positive in 2019, how long can you keep adding to a losing investment position? In fact, Dalbar’s research shows that the average investors can only stay invested in stock markets for 3.4 years. SIT may generate 9% return for the past 9 years, but it is very likely that is not the return you got. As counter-intuitive as it sounds, regular savings plan is a lousy strategy in a volatile market because it increases your portfolio risks. Most retail investors have no will power to stay on course. Does it mean you should stop your regular investment plans? No. My recommendation is that in a market like this, instead of regularly invest into stocks and pray it will make money in the future, continue your regular contribution, but to a money market or short duration bond fund. In this manner, you can deploy the funds whenever the opportunities arise. The difference between keeping a money market fund and keeping cash is that the former gives you higher interest and also a “mental trick” that you stay invested. Holding cash is like getting off a train, When the train starts to move, it is harder to get back on. The price movement in the financial markets will tell you more than any analyst or economist ever could. At the same time, the market is a big humiliator, it crashes when you are most optimistic and makes a turn around right at the time you give up. There is a commonly repeated marketing narrative that “since you cannot time the market, the only thing you can control is the cost”. This is what I call penny wise pound foolish. Controlling your investment cost is important, but your top priority in 2019 should be controlling the risk of your financial portfolio. 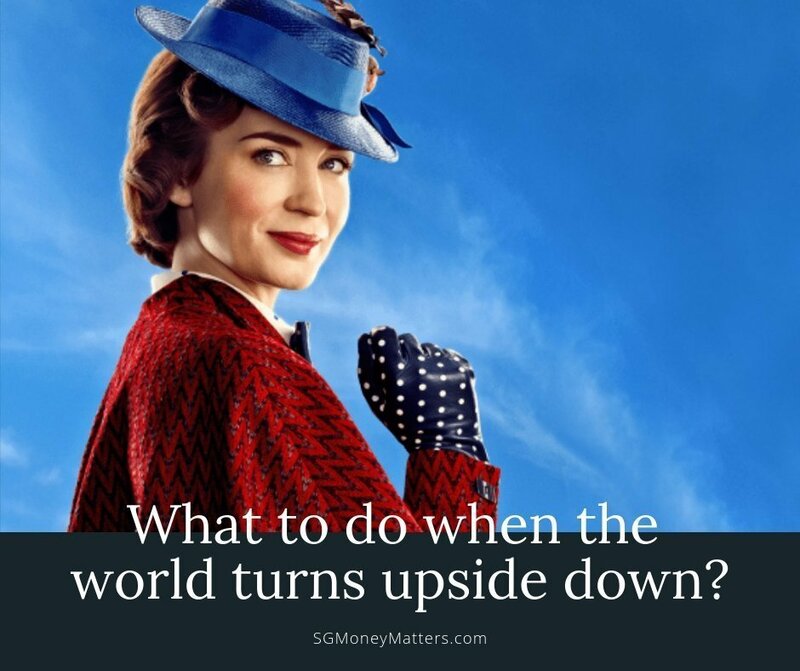 When the world turns upside down, the best thing to do is turn right along. You need to adapt your financial assets to profit in both good and bad times. In the course of my work, I help my clients review the portfolio risks regularly. Click here if you want to find out more about my investment philosophy and process. What do you think about these 5 predictions? Leave your comments below and let’s discuss. Generally, a good article with many valid points although I have a different opinion about investing in the China stock market. I think corporate governance in China is still weak compared to most listed companies in developed markets and hence, it is really more of a gamble investing although there is no doubt that money can be made. 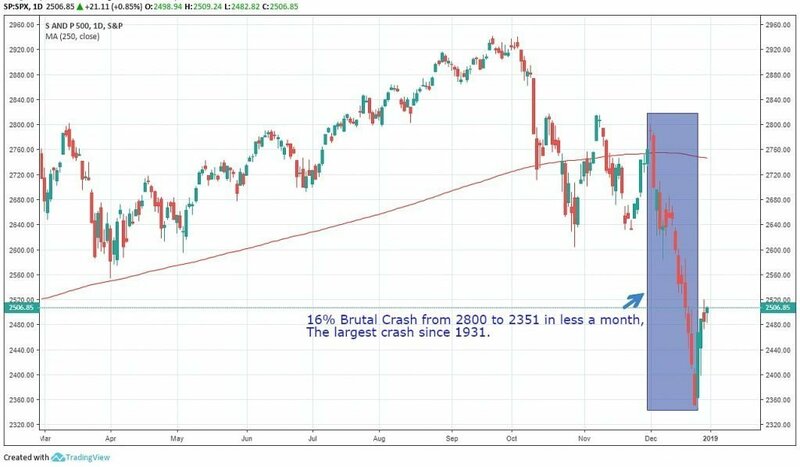 The stock market crash in Dec last year is an indication of the volatility to come in 2019 & 2020. In general, the market is worried but most are not quite sure where the next crisis will come from. The last one in 2008 was due to the sub prime mortgage issue exacerbated by banks selling very highly leverage Mortgage backed securities. That led to a banking crisis that shook the whole world. So, it would be helpful to predict what are the likely causes for the next financial crisis? Some say it could be due to high corporate debt as well as emerging markets/Europe debt. Others say it could be a currency crisis which is exacerbated by high US debt. A few very insightful experts are also saying that the US-China trade war could escalate into a real world war that will eventually leads to a major global recession. 1. Trigger for next crisis: I believe it will be from US de-leveraging. Unlike in 2018, this time is not from the property mortgages, but corporate debts. In the past decade, US companies have borrowed mountains of debts to please their shareholders by paying high dividends and pushing up the stock prices. Now cheap money is over, it is payback time. 2. Real world war: it is a possible event, but I think the form of the war could be different. Instead of outright wars between the two giant countries. It could be in the “peripheral countries”. I take it as a “black swan” event.